Some snippets of the history of Anderston, its people and its places, reaching beyond the confines of St. Patrick's Parish. If you have any historical information about Anderston and its people, past or present, please e-mail them to us by clicking below. Two eminent Anderstonians: Eugen Francis Charles D'Albert and Arthur Henderson. Never heard of them? Click below to download their mini biographies. 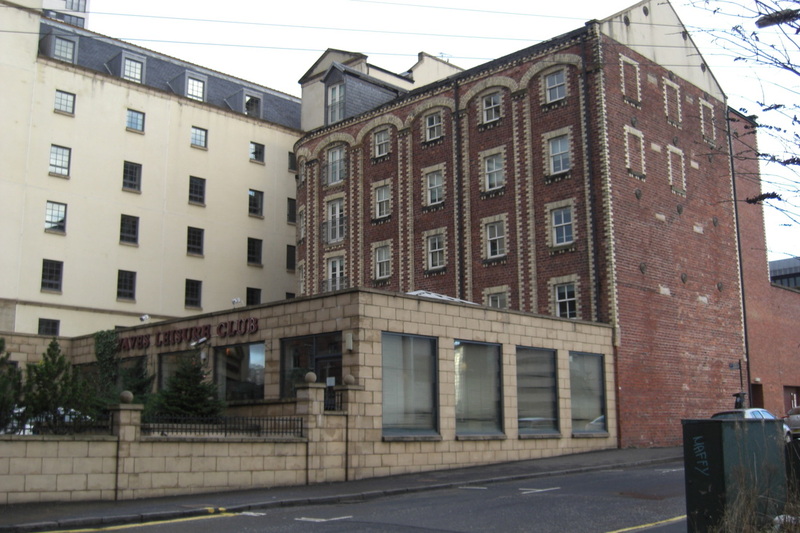 William Simpson was born above McLean’s public house at 44 Carrick Street, Anderston (below, right) on 28thOctober 1823, the son of James Simpson, a shipyard worker and Ann Johnstone, who took on various tasks to help the family finances. He was to become the first acknowledged and world-renowned war artist who covered conflicts in many parts of the globe from China to America. It is for his coverage of events in the Crimean War that he is chiefly remembered. From Anderston, where he first showed himself to be a talented artist, William went to work in a Glasgow architect’s office and then, in 1851 to London. The Crimean War broke out in 1854 and he accepted a commission to record in word and picture the battles at Balaclava and Sebastopolfor newspapers back home. In 1858 he was appointed war artist and correspondent for the Indian Mutiny. There followed assignments in Russia (where he attended the wedding of the future Tsar Alexander III), Jerusalem, Prussia, Abyssinia, Egypt, China, Japan, America, Greece and Afghanistan. William Simpson did not confine himself to art; he was intensely interested in archaeology, anthropology, philosophy and religion. His work in various fields was recognised by a number of professional bodies such as the Royal Geographical Society and the Association of British Architects. He published in the year of his death “Glasgow in the Forties” which reproduced his early watercolours. This polymath attracted the attention of Queen Victoria and her son the Prince of Wales with whom he travelled to India, to the marriage of the Crown Prince of Germany in Berlin and to the Coronation of the Tsar in Moscow. He was a frequent visitor to BuckinghamPalace and Balmoral Castle. In contrast to his early poverty, William’s later life was comfortable and his marriage to Maria Eliza Burt in 1881 when he was fifty-eight proved to be a felicitous and enduringly happy union. He remained throughout his long life an enthusiast for his home city of Glasgow and often spoke and wrote of it in the most affectionate terms. Balaclava and Crimea Streets, adjacent to his birthplace, recall his adventurous life. William Simpson died on 17thAugust 1899, his beloved wife and daughter at his side. This Old Anderstonian is buried in Highgate Cemetery, London near the tomb of Karl Marx. Conti gave the blessing and Reverend Donald Michael MacInnes of St Columba’s Church, St Vincent Street, read a tribute in Gaelic in honour of his clansman who had been awarded the medal which takes precedence over all other honours. The name of Gunner Hugh McInnes is inscribed on the Victoria Cross Memorial in the Chapel of the Royal Artillery, Woolwich, London. Despite the wholesale destruction of Old Anderston in the late nineteen-sixties, there remain a number of buildings which are worthy of note. In this context the Anderston name is broadly construed to refer to the area between, roughly, Pitt Street and Radnor Street and the Broomielaw and Park district. Anderston and Surroundings? Greater Anderston? Whatever, the idea is to take note of those buildings within and around the old Burgh’s purlieus which would be familiar to Anderston folk past and present. Here are some of them. 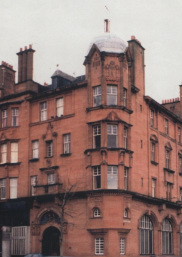 This fine building was erected (1899-1900) at a time when thrift was the order of the day and when the Anderston area was host to half-a-dozen banks. It was the work of architects well known in Glasgow, James Salmon Junior and J Gaff Gillespie. The sculpture was by Albert Hodge and Johan Keller who reinforced the image of the canny Scot with, above the door, a bust of Savings Bank Movement founder Henry Duncan who is seen tapping his head knowingly and carrying a money bag. The building is unique, but influences of other building designs may be noted, particularly William Leiper’s Sun Life building on the SW corner of Renfield/West George Streets. 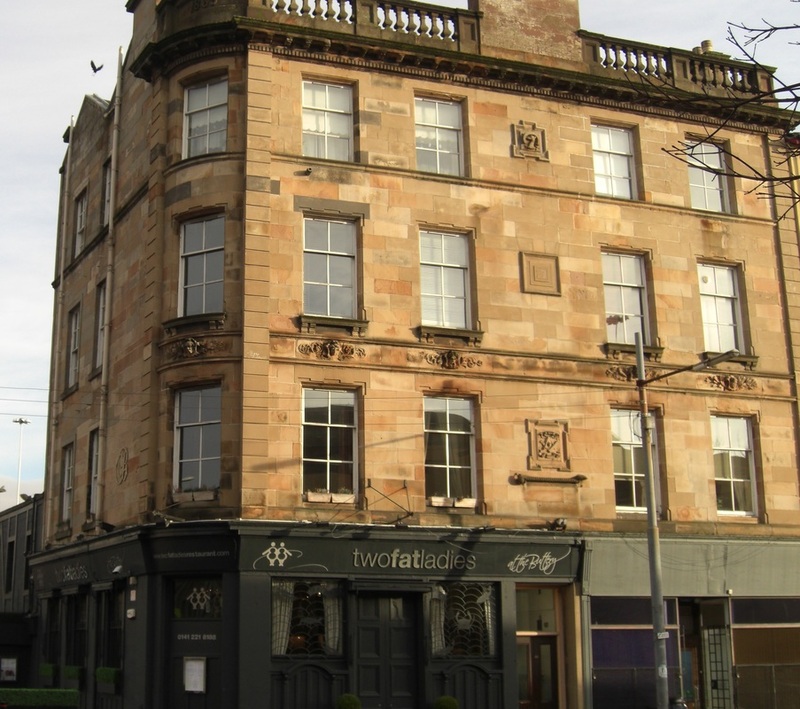 The famous and contemporaneous Hatrack building (144 St Vincent Street), by the same architects may also be referenced. It is described as Art Nouveau of the Glasgow Style a combination peculiarly Glaswegian. Turning a corner with a tower is also a favourite Glasgow device and is used here to pleasing effect. The modern extension to the west clearly owes more to commercial expediency than aesthetics. One wonders why this building escaped the attentions of the demolishers when buildings like Anderston Library and Cranstonhill Police Office, arguably of equal merit, fell. It is not common for industrial buildings to be included in lists such as this, but this one has a claim to distinction. 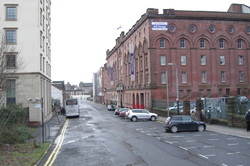 It is one of the few nineteenth century buildings extant in Anderston and it continued to house the same industry from the time of its construction in 1870 until its closure in the latter part of the twentieth century. Built of polychromatic brick, it was formerly mirrored across the road in Houldsworth Street by a building similarly constructed. Not the prettiest edifice, but handsome in its way, solid and practical for its industrial time and purpose, its arcaded windows showing that the functional need not be ugly. In 1840, the founder of the firm walked from Harworth, Nottinghamshire to Glasgow to set up a saw manufacturing business. 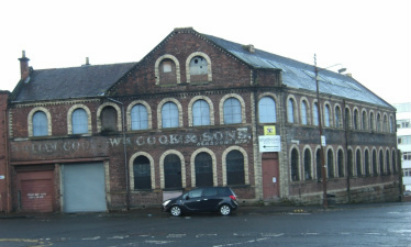 The enterprise flourished and, though the Glasgow operation was given to relatives through marriage in 1920, William Cook & Sons further developed and diversified in Sheffield, so a company which grew up in Anderston exists to this day as a major player in the steel casings industry. 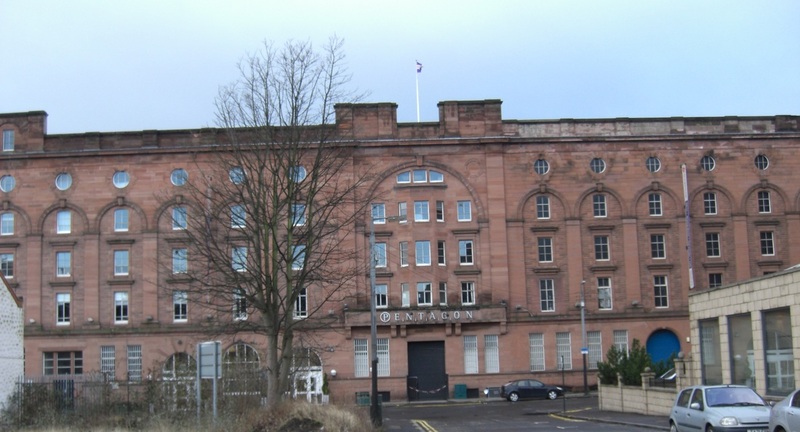 Like Glasgow Saw and File Works built in 1870/1 in red and white brick for Steven & Struthers, brass founders, it is partly two and partly three storeys, with a large circular fanlight. A bit the worse for wear now, but bold in its conception. 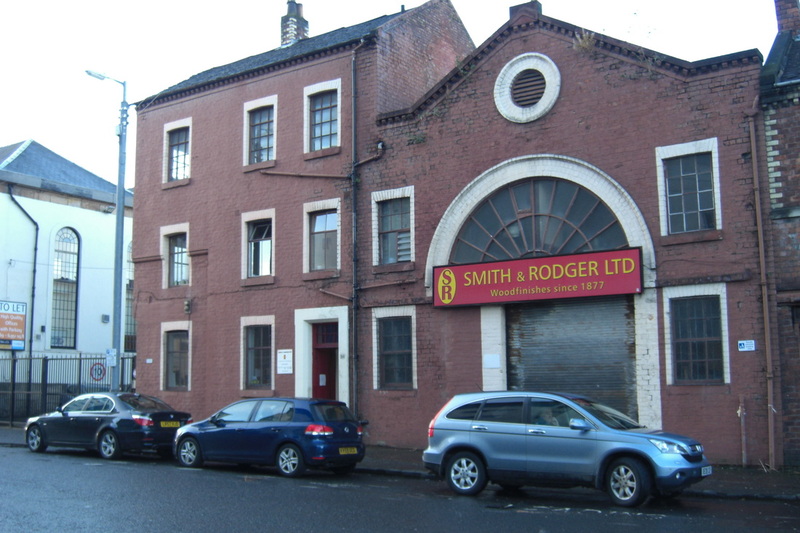 It remained a foundry until 1914 when it was reconstructed as a paint works for Smith & Rodger and functions as such today. 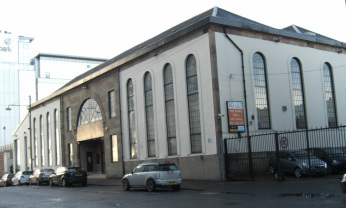 Certainly the oldest building in Elliot Street and the most senior of Anderston’s industrial buildings, this was erected in the early 1850’s for James Aitken & Co. Tall, but originally of one storey only to accommodate the type of work that was carried on within, it has tall, elegant arched windows, the frames of which are cast iron as is the prominent fanlight. When the foundry and heavy engineering functions ceased it saw service as a motor engineers' workshop. The impressively large, arched central doorway leads to what is now the ground floor of an office complex. The architects who oversaw the conversion to its present state were clearly sympathetic to the building's original design and have altered it only internally. Similar sensitivity was displayed in the conversion and extension of the Ca d'Oro building in Gordon Street/Union Street. Another nineteenth century industrial building which has stood the test of time, this one was built c.1877 and was originally for P&R Fleming, ironmongery manufacturers, later being occupied by J&A McFarlane who made that household essential of your great-granny's time, the indispensable mangle. Like many of its neighbours it was of red and white brick construction. It rises four storeys on its Houldsworth Street frontage and stretches nine bays back towards Cranston Street. Later still, the firm of Brown & Tawse, tube manufacturers had their factory there. 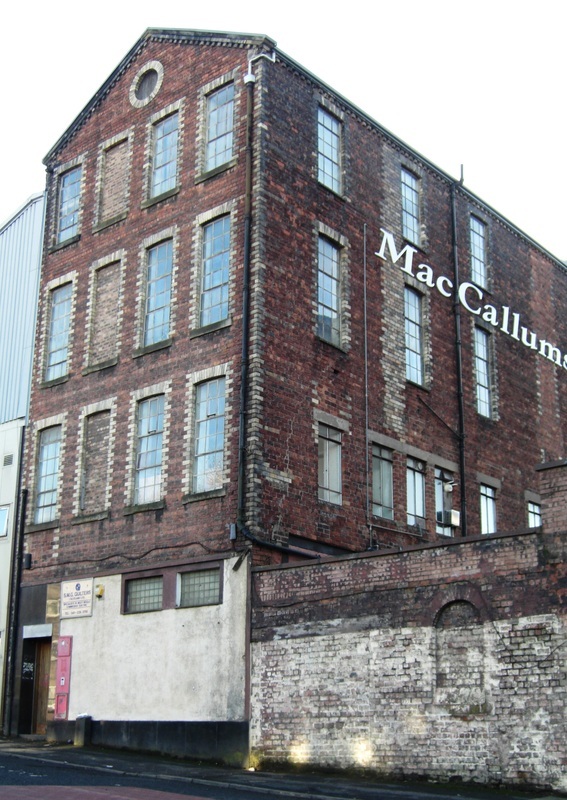 Today it is occupied by MacCallum's of Troon, sea food merchants. 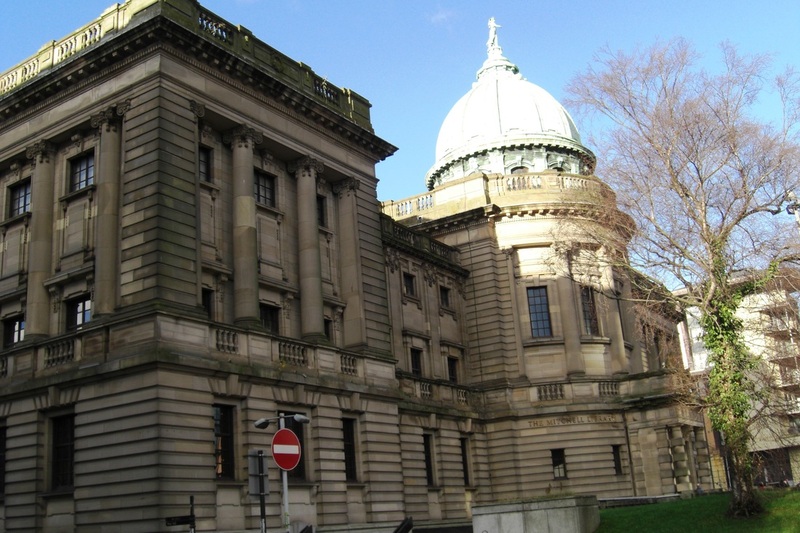 The original Mitchell Library was built between 1906 and 1911 to the plans of William B Whitie, a Glasgow architect. It reflects the civic pride and ambition of the Second City of the Empire in Victorian and Edwardian times which gave it buildings such as the City Chambers and Kelvingrove Museum and Art Gallery. Its most prominent feature is the massive dome, surmounted by a female figure representing literature, the work of TJ Clappertosn of London. Other decorative features are typical of their time. 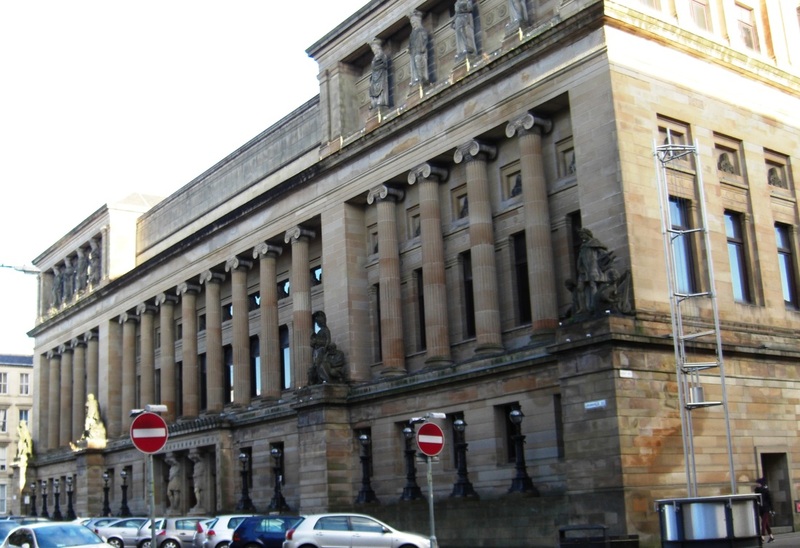 Glaswegians are very fond of this building and it is admired by visitors to the city, as well as providing generations of students with the space and facilities to progress in their education. Strangely, the Mitchell’s aspect has been improved by the construction of the M8 ring road which cut a swathe through Anderston and generally was disastrous for its older buildings, since it could now be viewed in wider scope over the sunken motorway across the way, crowding tenements having been swept away. The other building of which the same could be said is St Patrick’s Church further down the street. St Andrew’s Halls burned down in 1962 but, imaginatively, it was made to rise again between 1972 and 1980 in the form of a new building (by Sir Frank Mears & Partners) housing an extension to the library, a theatre and cafe, so that the finished article is of a satisfying whole. Memories of the old Halls are stirred by the retention in Granville Street of James Sellars’ 1877 façade featuring dramatic figure groups by the famous Glasgow sculptor John Mossman. The imposing collonade stands at first floor level in front of recessed windows and the triple doorway is divided by imposing Atlantes. The fire of 1962 might well have engulfed the priceless contents of the Mitchell Library but for the prescient provision of an internal safety gap between the newer and older buildings. All in all, a building complex of which Glasgow can justifiably be proud and Anderston in particular be glad to have on its doorstep. Part of the rapid expansion of Anderston in the early nineteenth century, the area began to be laid out in 1815 when Glasgow’s trade with the rest of the world depended heavily upon the busy Clyde quays, notably those on the Broomielaw. For efficiency, goods being imported and exported were processed or manufactured as close as possible to where they were brought in or taken away and so developed the foundries, mills and, later, bonded warehouses around Washington Street. The huge Washington Flour Mills on the SW corner with Broomielaw is no more but other buildings remain, having assumed other guises. Anderston Rice Mills, 27 Washington Street. There were two separate buildings later linked by a kind of open walkway. The first, built as a cotton store in 1825, was a four- storey, solid building which was converted to a steam flour mill in 1845. Its neighbour comprised five storeys of red and white brick constructed in 1865. Demolition loomed in 1989 but both were rescued by their incorporation within the new Milton Hotel, now the Menzies Hotel. Another example of heritage preserved by the authorities’ insistence upon retaining listed buildings, the 1865 building has exposed brickwork and original cast iron pillars internal to an apartment block within the hotel complex. The Pentagon Centre, formerly "the largest bonded warehouse in the world"
The Pentagon Centre, 30-46 Washington Street. Formerly James Buchanan’s Bonded Warehouse, this massive building is now home to a variety of enterprises. 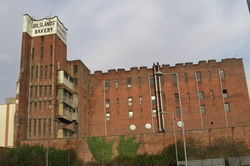 It was built between 1896 and 1907 and at that time was claimed to be the biggest bonded warehouse in the world. It is actually two buildings by different architects, although, like Ernie Wise’s hairpiece, you can’t see the join. The north section (1897) is by AV Gardner and the south by HE Clifford who was also responsible for the adjacent Washington Street School qv. 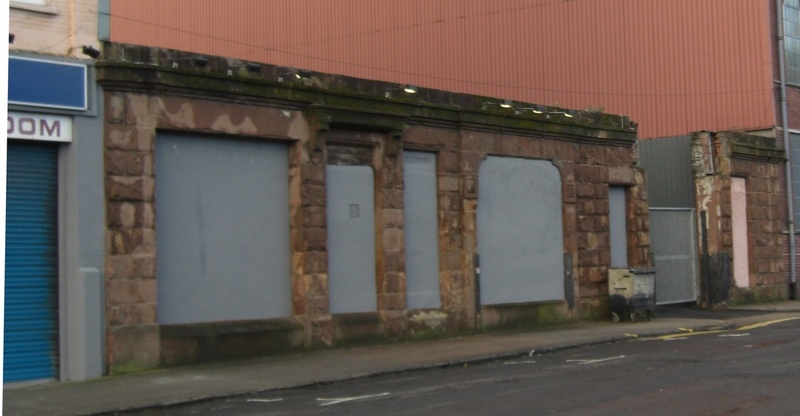 Faced in Locharbriggs sandstone, two sets of six bays present to Washington Street and seven bays extend westwards to what was Clydeferry Street, now part of the undercroft of the approach to the Kingston Bridge, from which side it offers a grim aspect. Crown Flour Mills, 66-68 Washington Street. The ground floor facade is all that is extant of the Italianate building of 1862 and its rear section of 1848. How long this vestige will remain is anybody's guess. Washington Street School, 12 Washington Street. 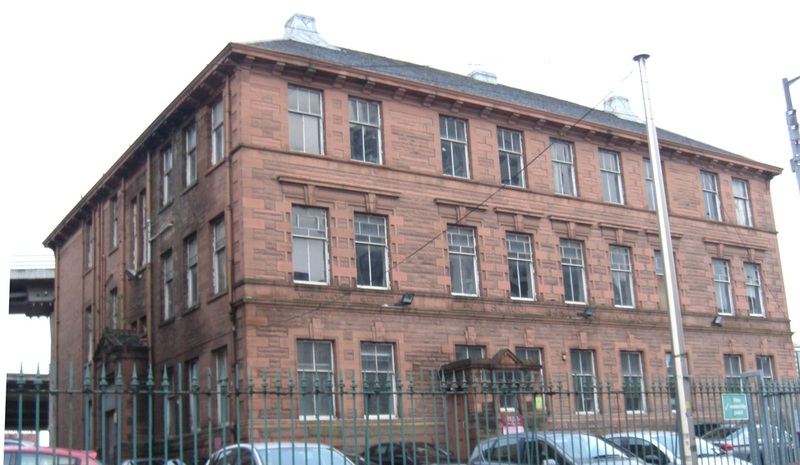 The most northerly of the street’s remaining edifices, this is a typically square school building favoured by the Glasgow School Board in Victorian times. It was built in 1890 to the design of HE Clifford who was also responsible for the south section of the nearby Pentagon Centre qv. It later served as the Strathclyde Arts Centre but is now derelict, although its playground serves as a car park for the Menzies Hotel on the other side of the street. Bilslands’ Bakery 75 Hydepark Street. The oldest structure left in this area and its future is in doubt. As it stands today it does not excite, simply being the rear portion of the building which once faced on to Hydepark Street. Here it was of three storeys, stretching over 13 ashlar-fronted bays which in 1881 accommodated not only 38 ovens but also stables to house 38 horses. Bruce & Hay were the architects and they also designed the 1912 extension of 5 storeys of 8 by 11bays. Stables with 63 stalls were provided by Burnet & Boston that same year. 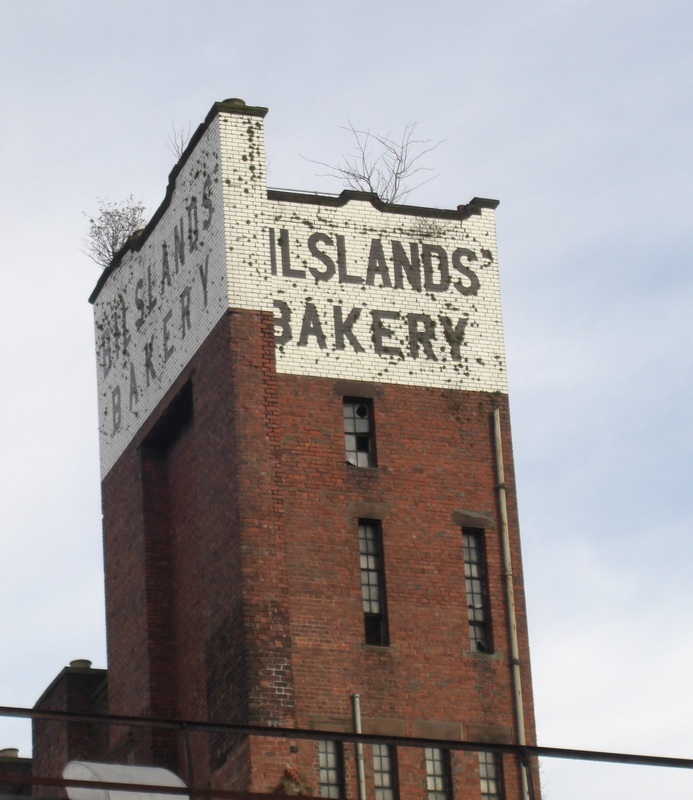 The square tower with its bold lettering BILSLANDS’ BAKERY has been familiar to Anderstonians for generations. Whether it survives plans for the redevelopment of the area remains to be seen. A rare survivor of the 1960s/70s cull. An unusual yellow sandstone building of 1869 with Masonic insignia carved into the first-floor façade. Under the second-floor windows are five busts set in foliage. At third-floor level is what is said to be the Belsches family coat of arms with the motto Fulget Virtus Intaminata (Unspotted Virtue Shines Bright). There may be some doubt about that, given that the crest is different from the recognised Belsches family crest and there is no obvious connection between the building and that family. Balustraded roof. 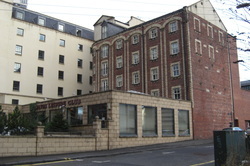 One of the few buildings to have survived the Anderston regeneration programme.